Advances in laser technology have resulted in far better results, and treatments that are safer, faster and more comfortable than ever before. Laser hair removal works on just about any area of the body where smooth skin is desired… underarms, face, neck, back, legs, shoulders, bikini line, you name it. Raleigh now offers the finest in laser hair removal for men and women at Blue Water Spa. Not all lasers, or all laser centers, provide the same level of treatments. We have provided training for physicians on laser hair removal since 1995 and we are a national training center for laser hair removal and medical spa technology. We continue to learn and train others about the safest, most effective, fastest, and most comfortable laser hair removal available. We perform over 10,000 laser hair removal procedures each year on men and women of all skin types. The lasers we use have been evaluated as the most effective in peer-reviewed medical journals. These sophisticated lasers target the root of the hair so specifically that they not only eliminate very dark and coarse hair, but are also the most effective lasers for the removal of fine hair and even hair with a light brown root. The lasers we use have a large spot size, proven to be most effective for hair removal. We also use lasers with the highest watts of power available to provide the maximum amount of power to the root of the hair without damaging surrounding tissue. * Please scroll down for more detailed information. Full legs or a back can be treated in just 20 minutes. Our lasers use an 18mm spot size (about the size of a quarter). Vs, older generation lasers with a 10 -12mm spot size (about the size of a dime). This larger spot size coupled with more hertz (power), means a faster and more effective treatment. We use a patented cooling device for that means a more comfortable treatment and eliminates the need for topical anesthetic. The DCD, dynamic cooling device is the ONLY cooling device that provides consistent cooling from the first pulse to the last. No cooling system is safer or provides a more comfortable treatment. 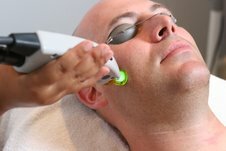 There is no one laser ideal for all skin types. Therefore, we have 2 different lasers for hair removal. Dark or tanned skin requires a laser with a long pulse. A longer pulse means that more of the laser energy is delivered to the root of the hair rather than to the surface of the skin where pigmentation problems might occur with lasers designed to treat light skin. We are confident with the way our lasers perform. We know that if our clients see results, they will be back. We only offer individual treatments, not a series of treatments. Each person will respond a little differently to treatment and some people will require more treatments than others. We don’t want money from a person until a treatment has been performed. For more information about laser hair removal or if you would like to schedule a complimentary laser hair removal consultation, please contact North Carolina Cosmetic Surgeon Dr. Michael Law today! You can meet his talented cosmetic surgery staff and tour the Raleigh Cosmetic Surgery Office.